everything LEB: Update and a Thank You! Update and a Thank You! Hello my lovelies! A big thank you for all your advice and input yesterday regarding my mirror issue. After taking all the comments into consideration I am going to keep the mirror up there for now. I'll add some sconces, decorate the mantle, and paint the frame. I thought about gold leafing it, and then Robin left me a comment saying to do so, and it just clicked. That is what I will do. So much debate over a friggin mirror you would think I was trying to decide weather or not to shave off my eyebrows off or something...gasp! Oh, and yes I still have the round mirror to put back up if I get sick of this one. I'm starting my own props closet. Can you guess what holiday is coming up this weekend?? I'll give you three guesses. I think you made a good decision and you will have backup if you want to switch off. Halloween decorations look great. I had the dripping blood candles up once and my daughter couldn't look at them! and the first 2 don't count?? Looks great! Love everything about your mantle. Great job!! Love the decor! And great idea about adding gold leaf! Also, have you ever tried Rub n' Buff? One of my all time favorite products! 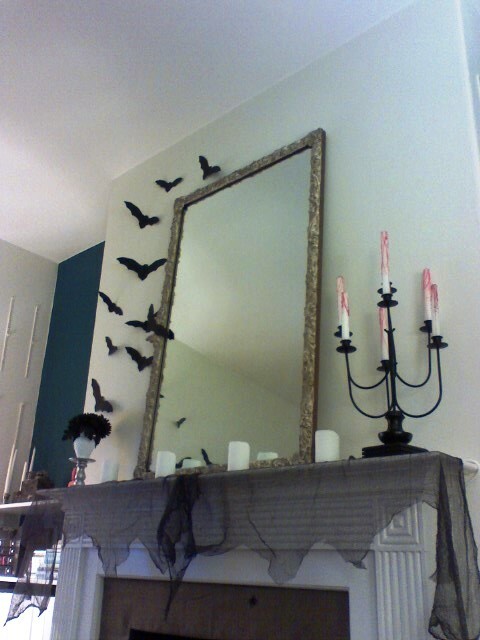 It would make adding a gold touch to the mirror a 20 minute project for under $5. I am so glad you decided to stay with the big mirror! Good choice! What are you being for halloween? and i'm still so crazy crazy about your halloween decor & am wishing we lived closer!!! i pretty much did nothing as of yet so it's going ot be one of those- let'e see how much last minute crap we can get done in a day- for our party.